The "Ice Tease" started out as the Monogram 1/24th Ice T. I chopped, sectioned and downsized the original body until it looked the way I wanted it to. It's about half the size of the original. With body work complete a mold was made from RTV. Refer to the Speedo Bandito article in the Guest Gallery for my background with resin casting. I took one of the castings and painted it Testors turn signal amber over a base of Boyd¹s Smoothster yellow. 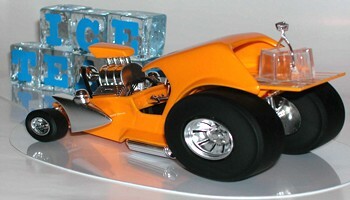 The chassis was made from a portion of the Ice T floor and finished with sheet and strip plastic. The front axle and steering linkage is aluminum rod with springs from the kit. 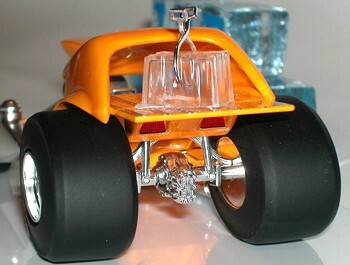 The rear suspension includes modified kit pieces plus aluminum tube for the axle and shocks. 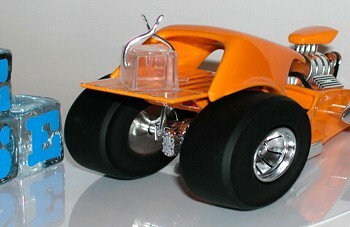 The front and rear wheels were made using the Street Cleaner and Roarin Rail outer rims with scratchbuilt centers. When done they were molded in RTV so I only had to make one of each. Front and rear tires came from the above mentioned kits but were widened for the size I wanted. The tires were turned sideways for that lowdown showcar look I was after. 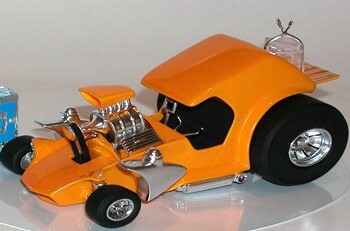 The gas tanks were arched to follow the shape of the wheels and the side pipes are kit items. 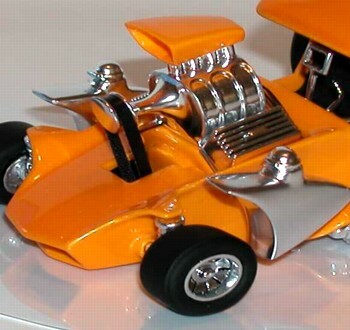 All chrome parts were painted with Alclad chrome over a black base throughout the model. The interior floor and dashboard are sheet plastic. I cut down the original Ice T steering wheel, shifter and seat. Decals were used for the gauges. I wanted a very "cartoony" engine and found what I was looking for in the Monogram Super Fuzz kit. It also had to look like a big block Chev to follow the original Ice T. The scoop was separated from the injectors and the blower from the block for easier painting. The plastic blower belt was removed and replaced with a rubber coated fabric material. I used an aftermarket distributor and kept detailing to a minimum as I wanted to duplicate the original Snap Draggin level of detail. The base was made from clear and sheet plastic to replicate ice. The blocks of ice are glass cubes from an art supply store with stick-on letters. The Ice Tease is a hot car for a cool cat if you know what I mean.